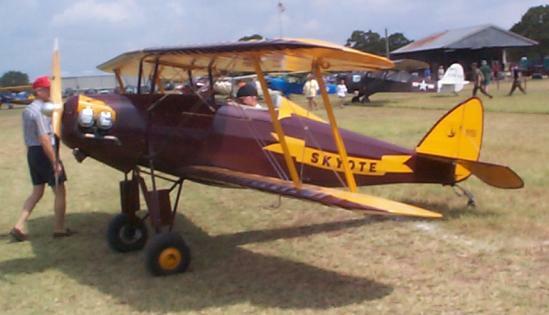 Pioneer Flight Museum held its annual AirFair Fly-in on Saturday, May 25. Gates opened at 9:00 AM, and we had a great turnout despite the threatening weather. Although the morning started with low clouds and poor visibility, the weather improved throughout the day. We finished with a bright, sunny day with scattered clouds - perfect weather for an outing! We had all of our airplanes and projects out on display, from the 1909 Bleriot XI to the 1941 Meyers OTW, and everything in between. The two Fokker projects (the D.VII and Dr.I Triplane) were assembled and parked on the future museum building's foundation slab, along with the Canuck. A Stearman biplane was hopping rides, and the crowds kept the pilot busy for the entire day. Even the vehicles got into the act, with the Indian motorcycle and Nash Quad on display, and various Model Ts driving around to add to the ambiance. Due to the bad weather early on, the fly-in turnout wasn't as good this year as last, but several hardy souls managed to brave the weather and fly in to the field. Surprisingly, most were taildraggers. Only about three tricycle-geared aircraft flew in to this year's show. The aircraft that did arrive were a nice mix of vintage birds and homebuilts, including some WW-II liaison planes, a Skyote homebuilt, three Hatz biplanes, and several others. Although we try to fly the vintage airplanes during this airshow, only the Luscombe and Meyers were able to get in the air this year. It was too windy to fly the Bleriot, and the Thomas-Morse was down with a broken crankshaft (discovered only two weeks before the show). We're looking for a new crank for the Tommy, but they're getting kind of scarce. It will probably be some months before we can get the Tommy back in the air. 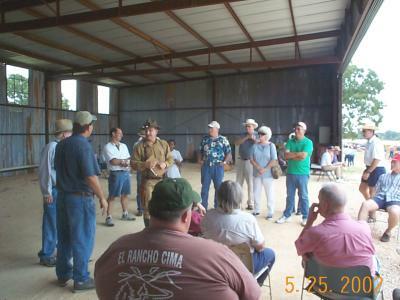 PFM held its annual membership meeting at noon in the open storage hangar. Four of the board memberships were up for renewal or open to replace resignations, and the membership present voted on candidates for these positions. The membership also delivered a message of appreciation to Tom Gaylord and Bill Broussard for writing and publishing the PFM newsletter, to Rene Gregory for printing and mailing it, and to Roger Ritter (blush) for maintaining the PFM website. 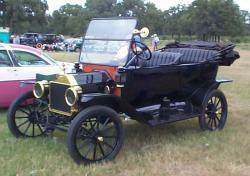 A vintage car club brought some of its treasures out to display to the crowds, and were able to park two or three rows of cars ranging from a 1913 EMF touring car to classic American cars from the 50s and 60s. 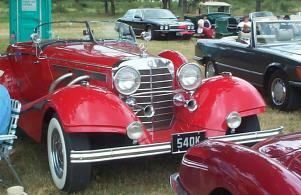 There were at least two Packards, a Hudson, a Mercedes 540K, an early Model T touring car, and others too numerous to list here. The Headquarters Company living history group set up an encampment to show what a typical military camp would have looked like at the turn of the century. The Headquarters Group specializes in the Border Period, exhibiting U.S. Army uniforms and equipment as used on the Texas border in the late 1800s and early 1900s. We parked a couple of PFM's Model Ts at their camp, and they used them for transportation during the day. Also present was the Western Front, a World War I German re-enactors group. 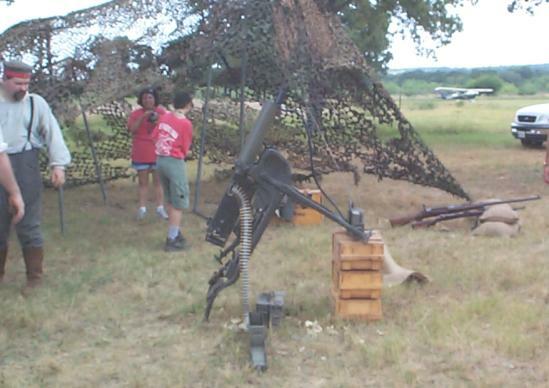 They had the loudest performance during the day, as they demonstrated a liquid-cooled .30 caliber machine gun. They were firing wooden practice rounds, so no airplanes were harmed in the making of this event! Several lucky kids got to fire a few rounds each, and everyone on the field knew about it when it happened.